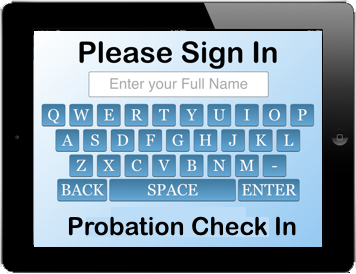 Probation Check In is a web application specifically designed to improve office efficiency for the community corrections industry. Using an Apple iPad, the sign in app provides an interactive notification system and long term documentation. Customer arrivals are accurately time and date stamped, stored for long term reporting and then displayed directly on the office computers of your staff. Staff can then acknowledge and checkout each person as they are attended to leaving a trail of accurate times and names of who, when and how long they were serviced. With budgets being crunched your office needs ways to reduce overhead. Probation Check In will reduce receptionist duties and give an efficient way to handle arriving offenders. The offenders can sign in and notify the officer at their desktop that they are waiting in the lobby. We use a secured Apple iPad to provide a simple and low cost queuing system. Probation Check In notifies the staff when someone signs in. They may need a specific officer, staff member or just came in from court. After they enter their name they are presented with choices that you program. You have complete control of the choice buttons and can change them at any time. The choice buttons categorize and sort your arrivals to give a more specific reason for the visit. With paper sign in sheets the information is hard to read and even harder to recall when needed. Our check in system keeps the data organized for years and can be recalled, sorted and printed instantly. Pulling a report on a specific offender, staff member or office is as easy as a click of a mouse. Print your reports for court to document your case. Management reports give valuable statistics. The system records an accurate date and time of sign in and reason for visit. With the daily report and the statistical reports, management can review performance and workload of the office and staff. Stats are kept long term and can be recalled by date range as far back as day one. It’s never been easier to get started! Check In Systems is now offering a free 30 day subscription to probation offices across the country. All you need is an Apple iPad and we’ll get you started. So simple to setup, you’ll have a check in system within minutes. We can walk you though the setup over the phone or send you easy to follow instructions. There’s no obligation.